Basket tomato plants not only look great in any setting, but they also save you a ton of space and make for healthier tomatoes! 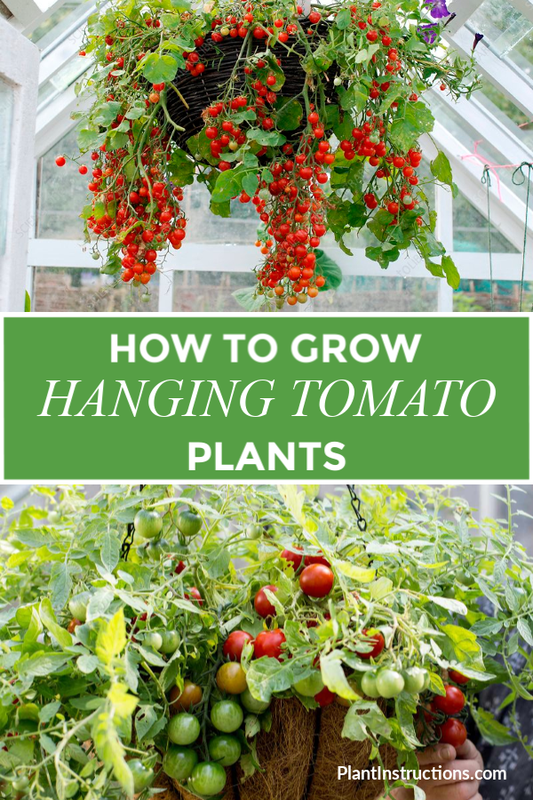 Learn how to grow hanging tomato plants with this easy to follow gardening guide! There are many upsides to growing tomato plants in hanging baskets, and apart from saving space, it also prevents against ground pests, weeds, and soil disease. Contrary to popular belief though, growing hanging tomato plants is not as easy as growing container tomatoes. This is because the plants themselves hang down, and their natural response is to turn up, towards the sun. When this happens, the stems bend into a U-shape trying to go up, and the weight of the fruit can sometimes snap the stems. This is why it’s extremely important to make sure that you have the right hanging basket (one that can sustain weight), and that you place your hanging basket in the sunniest location possible. You may be tempted to purchase cheap plastic hanging baskets for your tomato plants, but they are not sturdy enough. Instead, choose a very sturdy and durable basket that is light in color. A dark colored basket will attract more light and cause the roots to dry out. Select a hanging pot that’s 12-24 inches in diameter and will hold at least 5 gallons of soil. Tomato plants have big and extensive root systems so they need a lot of room to grow. For tomatoes to grow healthy, they need at least 8 hours of direct sunlight per day. 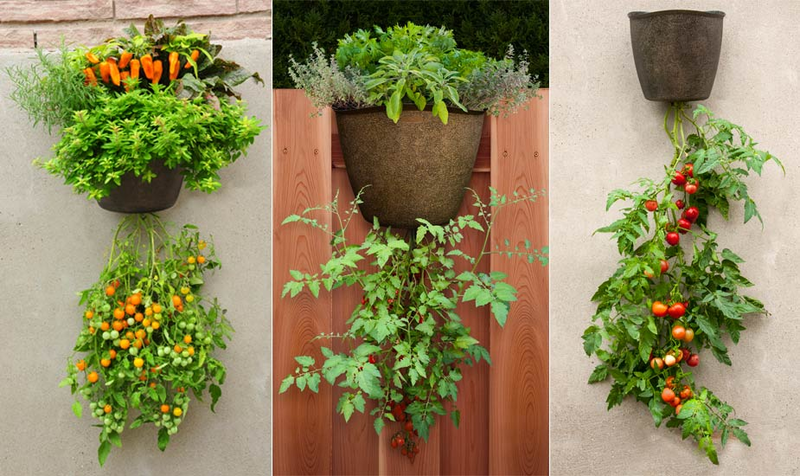 Choose a spot to hang your tomato basket that isn’t blocked by buildings, trees, or other obstructions. This means you should be careful when hanging your tomatoes under a poor roof which may not give the tomatoes their full 8 hours. If possible, choose a south side location to hang your tomatoes. For those in USDA zone 7 and above, choose a spot that receives some shade in the afternoon, to protect the plant from intense sun. Those in USDA zones 6 and below will require a full day of sun. Tomatoes can become quite heavy and that means a lot of strain on the stems. A fully mature tomato plant can weigh as much as 50lbs in a basket (with soil), so think of investing in sturdy support. Head to your local hardware store to find wall anchors and hanging gear for the best support for your tomato plants. Midnight Snack Hybrid: Produces large clusters of fruit and has a deep red, sometimes dark purple color when exposed to the sun. Napa Grape Hybrid: Produces 1 inch tomato fruits that are incredibly sweet and grow on the vine. Tiny Tim: Produces 1 inch cherry tomatoes with amazing taste and also resistant to disease. Tumbler Hybrid: Produces bright red cherry tomatoes that thrive in hanging baskets. Can produce as much as 6 lbs of fruit per season. Tumbling Tom: Cascading yellow tomatoes that are very sweet and 1-2 inches in diameter. 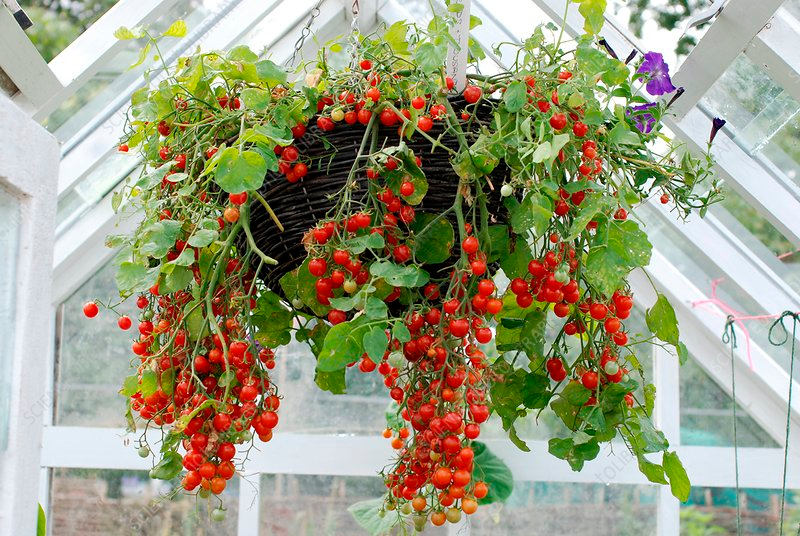 Growing and planting hanging tomatoes is very similar to the way you would plant hanging flower baskets! Start by filling the container with a good quality potting soil and add a slow release fertilizer. Plant your tomato plant into the soil and water it well. Water daily, or sometimes even twice a day depending on the climate. How to Grow Hanging Tomato Plants was last modified: April 10th, 2019 by Aniela M.
NextRaven ZZ Plant: The New, Stylish Plant You Need!